Avocados help to increase the rate at which fat is converted to energy, thus boosting your metabolism. They also help to increase certain hormones that are further aid weight loss in both men and women. Avocados inform your brain that your stomach is full, thus helping to prevent unhealthy food cravings. Talking about healthy fat-burning fruits, we cannot miss out on the wondrous apples. They are a big help when it comes to losing weight. Apples are high in fibre and low in calories- this makes them a great snack. This is just what you require to make you feel full and stay away from binging. They are also rich in vitamins B and C, antioxidants and minerals that help to keep your body energised. The nutrients in them help to boost your metabolism, and make your body more efficient in buring calories. They have a low glycaemic index; which means that they will satisfy your sweet tooth without adding extra sugar in your body. 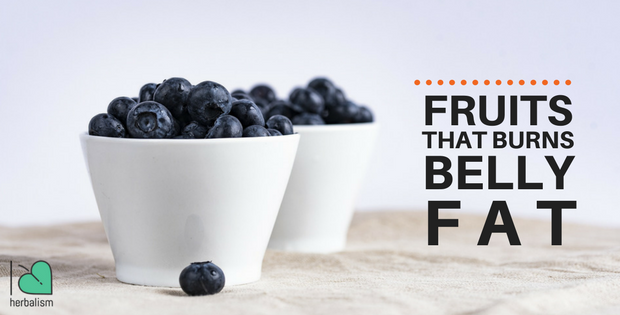 Even studies have shown that people who consumed blueberries daily had better shot at belly fat loss than those who did not. According to some fitness experts, if you eat grapefruit daily, you can actually fasten your weight loss journey, without having to make too many changes in your diet. The high water content in grapefruits helps to cleanse the system from within, and also keeps you hydrated and satiated. In addition, the fat burning enzymes in the fruit make it a super food for weight loss. Since it takes more energy to digest this fruit, it further helps you burn more calories. According to studies, the polyphenols antioxidant in this fruit help to boost your metabolism. They also enable the body to get rid of the toxins. What’s more? Pomegranates help to lower your appetite. Which is why, you should drink a glass of pomegranate juice in breakfast or add it to your salad bowl before lunch. So, indulge in this sweet fruit to satisfy your sweet tooth and your untimely hunger pangs. You already know what a great detoxifying fruit lemons are. Well, this and much more makes this tangy fruit a part of our list.